The Hero Glamour is the perfect combination of style and power. The 125 cc Glamour bike is powered by an ASFS engine to keep you ahead in the city traffic. 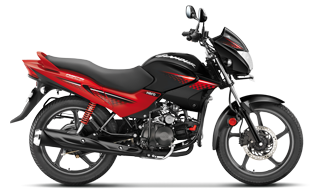 Its contemporary graphics and unique design adds a touch of style, making it one of the best 125 cc bikes. 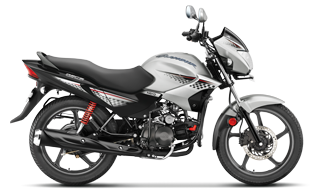 Take a look at the Glamour bike images, to explore the dashing looks and specifications! If you are eager to know the price of the Hero Glamour, contact your nearest dealer to get the on-road price of the bike in your area. To find the price of the Hero Glamour in cities such as Mumbai, Delhi, Pune, Bengaluru, Chennai, Chandigarh, Kanpur, Lucknow, Kolkata, etc. The new model Glamour bike is powered by a 124.7 cc engine to give you that additional power you’re looking for. With a max power of 6.72 KW (9.1 Ps) @ 7000 rpm, expect the Glamour motorcycle mileage to give you a better fuel economy than its other counterparts with similar specifications. 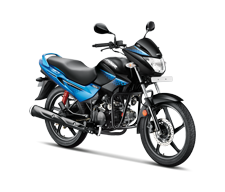 The 125 cc Glamour bike comes with telescopic hydraulic shock absorbers in the front and swing arm with hydraulic shock absorbers in the rear, giving the motorcycle the perfect balance it requires on rough terrains. The Hero Glamour self-starts with the press of a button. However, if you ever have a problem with the self-start in rough terrains, you can kick-start it and continue your speedy journey to your dream destination. Built with a fuel tank that has the capacity of 13.6 litres, the 125 cc Glamour bike will take you as far as you want to chase your dreams. The Hero Glamour bike has a 12 V - 3 Ah MF Battery that lasts longer than even your longest rides. The suspension, engine, tubeless tyres, fuel capacity make Hero Glamour the ideal bike for long, peaceful rides in and out of the city. Don’t forget to check out the Glamour bike photos! 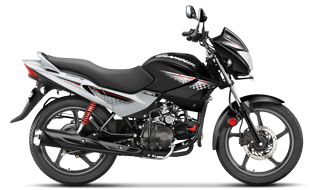 Also check out the 360° view of Hero Glamour Motorcycle so that you can understand and view the specifications in detail.